Securing an impressive win during Saturday’s opening moto, Kevin Brumann has made the best possible start to the 2018 YZ125 bLU cRU Cup SuperFinale at the man-made Imola motocross circuit. 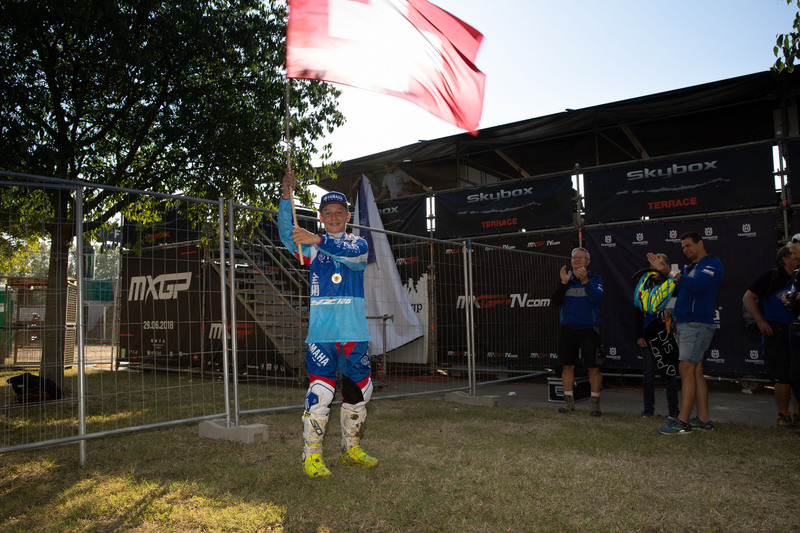 With selected riders from 17 different countries taking part at this third edition of the YZ125 bLU cRU Cup, the 14-year-old Swiss Brumann will be back looking for another victory at the second race on Sunday morning. Coinciding with the final round of the 2018 FIM Motocross World Championship, the 2018 YZ125 bLU cRU Cup SuperFinale delivered race fans a spectacular opening moto. With 39 youngsters lining-up at the starting gate aboard GYTR-kitted YZ125 machines, it was #253 Kevin Brumann who took the holeshot and went on to cross the line first at the end of the opening lap. Suffering a small mistake on lap two, Brumann allowed Sweden’s Liam Hanstrom to take on provisional lead. Making a crucial pass on lap four, Brumann regained control of the race and lead every lap until the flag drop. With Joel Rizzi coming to force at the closing stages of the race, the young Brit kept closing the gap to the leader to eventually cross the finish line in second position and less than one second behind Brumann. 15-year-old Liam Hanstrom secured third. Featuring big jumps and deep-rutted corners, the man-made track inside the historic Imola road-racing circuit produced some outstanding racing for the 2018 YZ125 bLU cRU Cup finalists. With Brumann and Rizzi topping the Free Practice and Time Practice sessions respectively, it was young Brit Rizzi who posted the best lap of the opening moto. All 39 competitors will continue battling for the sought-after invitation to Yamaha’s bLU cRU Masterclass during the second and final moto of the YZ125 bLU cRU Cup SuperFinale on Sunday. Out of the top-three in the Cups’ final standings, two more wild-cards racers will take one step closer to winning the ultimate prize, a place on the MJC Yamaha Official EMX125 Team for the coming 2019 season. The second and final moto of the 2018 YZ125 bLU cRU Cup SuperFinale will take place tomorrow – Sunday, October 30 – at 08:45am CET and will be broadcasted live on www.mxgp-tv.com.